Special Themed Tours are Back for the 2015 Season at Ringwood Manor ~ The History Girl! Ringwood Manor is happy to announce that they are bringing back two very popular specialty tours for the 2015 season! Both the “Child’s Life Tour” and the “Grounds and Gardens Tour” will be offered to the public starting in June and running through the end of October. The “Child’s Life Tour” will be offered every Saturday and Sunday, starting on June 6th, at 1:00 pm each day. The “Grounds & Gardens Tour” will be offered every Sunday, starting on June 7th, at 2:00 pm. If you have already been on the interior house tour, these tours will greatly enhance your knowledge of the history of the Ringwood Manor estate! The “A Child’s Life” tour was developed for children and is all about the Hewitt children. The program uses first-hand accounts to help younger visitors understand what it was like to spend summers at the estate 150 years ago. If you thought living without modern entertainment like television, DVDs, and computers was boring, think again! Designed to be fun and amusing, these tours are great for families and visitors of all ages! Mrs. Sarah Hewitt and three of her six children, Amy, Eleanor, and Sarah, circa 1865. Ringwood Manor is the summer estate of the Cooper-Hewitt family. The Victorian mansion contains 51 rooms and all the original belongings of the family. Fortunately, the family didn’t just leave behind their furniture and artwork. Many of the Hewitt children’s favorite memories of growing up at Ringwood have been passed down to us by Edward Hewitt in two memoirs: Ringwood Manor: Home of the Hewitts and Those Were the Days. The stories and anecdotes that are told from these books make it clear that, in spite of having lived more than 100 years ago, the Hewitts actually had a lot in common with children today. Like any family, the Hewitt children were full of energy. With 22,000 acres of property, they could often be found fishing, hunting, swimming, and horseback riding. The large, rambling mansion provided plenty of indoor fun with activities like hide-and-go-seek and sliding down the staircase banisters. In addition, Eddie and his brother Cooper were getting into all sorts of trouble at their summer home, going on adventures and playing many practical jokes on their guests. So, if you’d like to hear about the family’s pet bear, or how the Hewitt boys played a prank using a raccoon and a suitcase, this tour is for you! “A Child’s Life” tour is approximately 45 minutes long and takes visitors through the historic house while these amusing stories are being told. All thirty of the rooms open to the public are shown, but the tour proceeds at a faster, more energetic pace. Scavenger hunts are provided to encourage visitors to look for some of the unusual features in the manor. At the end of the tour, children and adults are invited to play with reproduction 18th and 19th century toys on the front lawn of Ringwood Manor. It’s a great way to introduce children to the site’s history! This year, “A Child’s Life” tours will be offered to the public at 1:00 pm every Saturday and Sunday through October 25th. The tour can also be given at times other than those listed above when special arrangements are made in advance. Groups of 10 or more wishing to take this tour are required to make advanced reservations. Tours are $3 for adults, $1 for children ages 6-12, and children 5 and under are free. The “Grounds & Gardens” Tours of the Ringwood Manor estate are 2-hour walking tours that take visitors around the property, discussing the historic objects on-site, the planned gardens and landscape features, the out-buildings, and even the historic cemetery. Historic photos will be shown to the group to give visitors an idea of what the site looked like at various time over the past 150 years. These tours are perfect for local history buffs or anyone who has ever wondered what all the “stuff” was at Ringwood Manor! Mrs. Hewitt and her daughters spent decades transforming the property into a beautiful Gilded-Age estate. Mrs. Hewitt once noted that, “She was unable to paint and picture, but she could create one.” Working with a variety of friends who were landscape architects, and influenced by their travels to Europe, the Hewitt women incorporated many different features into the gardens surrounding the Manor. Hear about who and what inspired them, and how it impacted Ringwood Manor’s grounds. 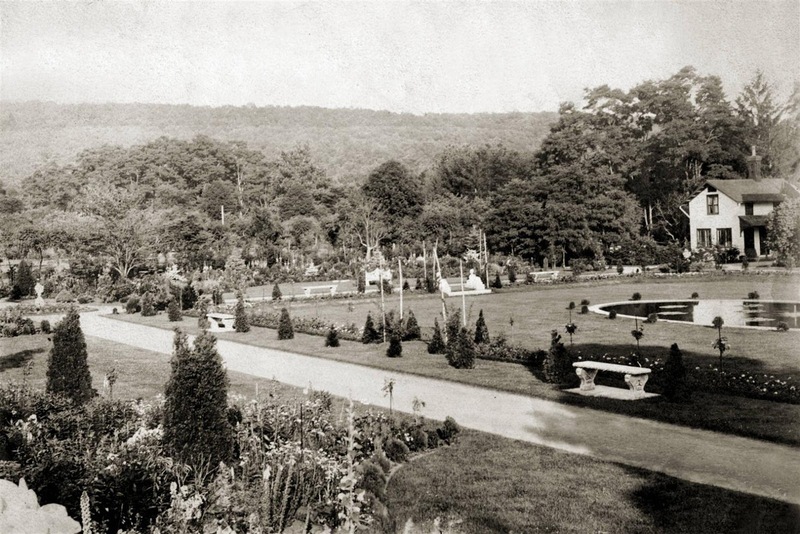 The Italian sunken garden at Ringwood Manor, circa 1900. Additionally, “Grounds & Gardens” tours include information about the outbuildings and built features scattered along the property. Visitors even have the opportunity to go into the historic blacksmith shop and carriage barn, buildings that are not open regularly to the public! Guides will explain the various historic objects on the property such as columns, iron objects and weapons, gates, and decorative sculptures and how they came to be at Ringwood Manor. The tour ends with a walk to the historic cemetery on the property, discussing important graves of noted persons. You will leave the tour with a whole new appreciation of the historic estate! The “Grounds & Gardens” tours will be offered every Sunday at 2:00 pm, from June 7th through October 25th. These guided tours are free to the general public. No advanced reservations are necessary to take the tour. It is advised that participants wear comfortable walking or hiking shoes and dress appropriately for the weather. Steady rain will cancel any scheduled “Grounds & Garden” tour, so it is advised that interested members of the public call the Ringwood Manor office at 973-962-2240 in advance to confirm the tour. “A Child’s Life” tour and “Grounds & Gardens” tours join the slate of programmatic offerings at Ringwood Manor, which include the regular interior house tours of Ringwood Manor and a variety of special events and lectures throughout the year. Public tours of the interior of Ringwood Manor are offered Wednesday through Sunday, year-round, between 10:00 am and 3:00 pm. These hour-and-fifteen minute long tours take visitors through 30 of the 51 rooms, discussing the owners of the home, the development of the house, famous friends and guests, and information on interior furnishings and artwork. Guided, interior tours of Ringwood Manor are $3 for adults, $1 for children ages 6-12, and children ages 5 and under are free. Please note that Ringwood State Park charges a per-car parking fee on weekends between Memorial Day and Labor Day: $5 per car for in-state residents, $7 per car for out-of-state residents. NJ State residents ages 62 years or older may obtain a “Senior Citizens Pass” at the Ringwood State Park office, which waives the parking fee to enter the park. For information about all of the tours offered at Ringwood Manor, along with the programs, events, and lectures offered at the site throughout the year, call 973-962-2240 or visit www.ringwoodmanor.org.